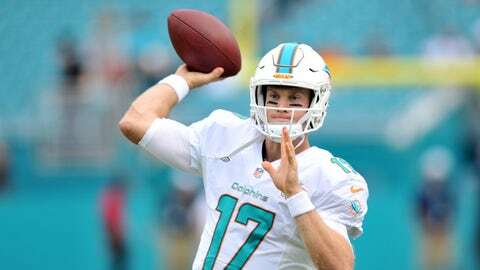 Ryan Tannehill's record-setting day was enough to earn himself AFC Player of the Week honors. Ryan Tannehill had the best game of his young career on Sunday against the Houston Texans, and it was enough to earn himself AFC Offensive Player of the Week honors. Tannehill completed 18-of-19 passes for 282 yards and four touchdowns, while he didn’t commit a single turnover for the first time since Week 2. He also netted a perfect 158.3 passer rating. With his incredible performance, he set a new NFL record with 25 consecutive completions, going back to his previous game. Tannehill also became the first player to throw three touchdown passes of 50 yards or more in a single half, which adds to the accolades he collected on Sunday. It’s the first time Tannehill has won the award, so he’s got a long way to go to catch Dan Marino, who was named AFC Offensive Player of the Week 20 times in his career. If Tannehill hadn’t taken home the award, his teammate Lamar Miller was probably next in line. Miller piled up 236 yards from scrimmage on just 17 touches, while he didn’t see the ball once in the second half.